What must I do to drop food out in the desert to be picked up a few days later in the park? Everyone knows I am a rule follower, and I want to follow the rules. Hypothetically of course, can I hide a Bear Vault 500 under some cactus with a bunch of food and Old Orchard "juice" in it, and keep the overloads from messing with it if they come across it? Probably. But now that you've speculated about a hypothetical situation, you are on the watch list kept by the funny hat lurkers on this site. A parkwide pre-violation alert has been issued. As Spock told Captain Kirk in the Wrath of Khan, if we go BY THE BOOK, then you can't hide a bear vault. You can do it and hope they don't find it. But if they do they would most likely remove it and that would endanger you. I don't think I would risk it. On the other hand, would they actually remove it knowing that it would endanger a hiker? You can bury it , that's an option. I have seen this done by many people who thru-hike the Hayduke trail, they bury their buckets of resupply to prevent animals from getting at them. I have heard tell of folks "hiding" a small food cache in a burlap bag that had been saturated with human smell. No hypothetical about it. 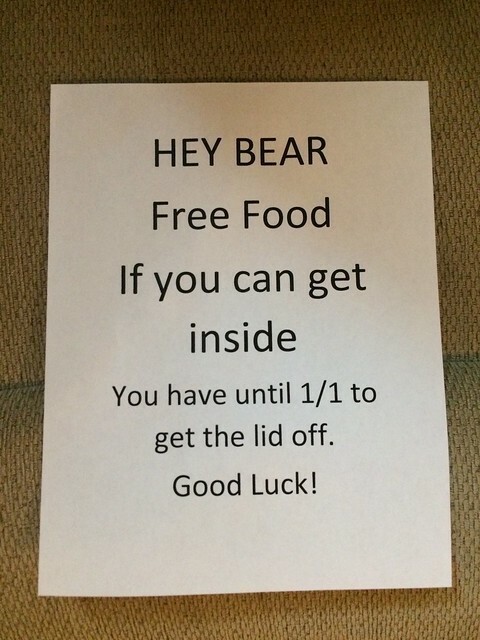 Yes you can leave any bear can, put a label on it with your name and date you will pick it up. Have done it several times with no problems. The NPS will not mess with it if it is a real bear can and won't endanger you either but they would give you a ticket if not a legal bear can. Burying is unnecessary with a bear can and would be a violation of park rules. So you can do it at Big Bend, I didn't know that. But then I don't understand your original post. What were you driving at? Soooooo.... something like this, but with our name on it? 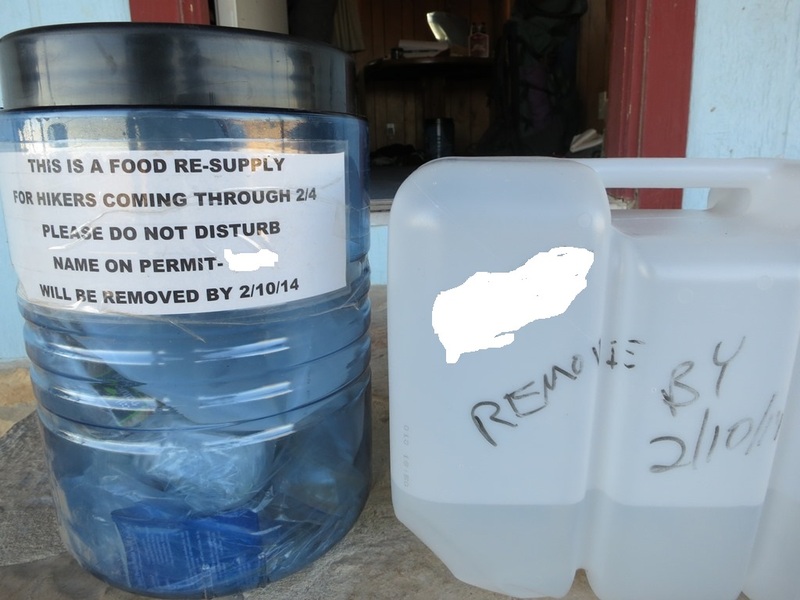 The Backcountry Regulations page on the BIBE website has had a similar statement that “caching of food and water is prohibited unless” you use a certified bear-resistant container. So for my caches, I put the required labels on the bear-resistant containers and left them at least 100 yards from anything significant. When I got my permit, the ranger asked what I was doing for water. I explained how much water I was carrying and briefly described my two caches. He made no comment, which I hoped meant that I was not in violation of any rules. Anyway, I tried to follow the rules. No one messed with them, although this is not surprising. Given the few people who go out there, it would be pretty remarkable if someone happened to find them. The BIBE site Backcountry Regulation page, Backcountry Food Storage page, and link to the compendium all seem to be down. As Mule Ears and others have recently reported, other pages or services have been down also. I wonder if there is an update going on? If so, we might need to check for any policy changes before our next hikes. I agree that the chances of anyone stumbling upon a well-placed cache are infinitesimal. Still, strange things occur. 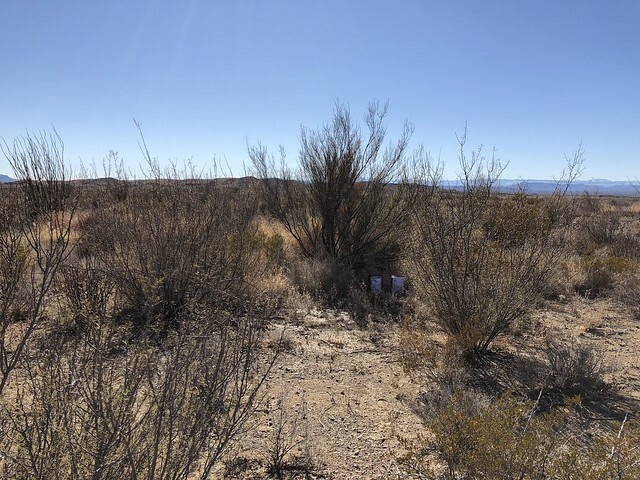 I usually wrap my BearVault caches up in a black stuffsack and shove them deep under a creosote bush, or sometimes even a cactus. Here are a few pics of past caches. Seriously? Someone or something opened your cache and did not eat the peanut M&M's? But I think wrapping the vault inside a black bag is an invitation for someone to look inside. Was there anything missing? Haha! No, no, no. My bad for not being clear. That first photo is of one of my caches that I opened myself. The only thing missing was my hunger after I gobbled up the first 2000 calories for dinner. But I think wrapping the vault inside a black bag is an invitation for someone to look inside. I wrap my caches in black sacks because I’ve found that otherwise sunlight, flashlights, and headlights can glint off of them and help reveal their location. I do, however, also reproduce all the identifying info (name, dates, etc.) on the outside of the sack, but in a place where it can’t be seen except on close inspection.